Last week, you may have caught my article about how to get started playing RPGs. This week, I will continue this introduction by focusing on the actual products you can purchase for beginners. Once you have decided on your system, you need to figure out what products to get. Both D&D and Pathfinder have beginner sets that make picking up the game and getting started extremely simple. Wizards of the Coast released the D&D Starter Set in July of 2014. 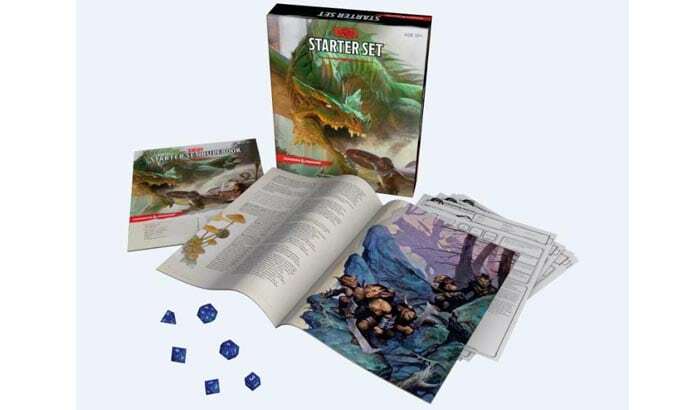 The box includes a 64-page adventure book with everything the Dungeon Master needs to get started, a 32-page rule book for playing characters level 1-5, five pre-generated characters, with character sheet, and a set of six dice, one of each kind that you could need to run a game. The adventure, The Lost Mines of Phandelver, is designed to take a group of 4-5 characters from level 1 to level 5. The booklet containing the adventure is easy to follow, and gives you plenty of room to improvise and have fun. Set in the Sword Coast region of Faerun in Ed Greenwood’s Forgotten Realms, the story is a fun, multi-session jaunt that should help players and Dungeon Master alike familiarize themselves with the rules, mechanics, and common setting for 5E Adventures. The Starter Set won multiple fan awards at GenCon in 2015, and two years later, I’m fairly certain that The Lost Mines of Phandelver is still one of the most posted about published adventures on the official D&D subreddit. Alternatively, if you are short on funds, Wizards of the Coast offers the basic rules for 5E, which offer a simplified version of the player’s handbook, information on how to create a character, mechanics, etc. The options are limited, but if you want to try it out without spending any money, this is the way to do it. Pathfinder has a similar product to the D&D Starter Set. 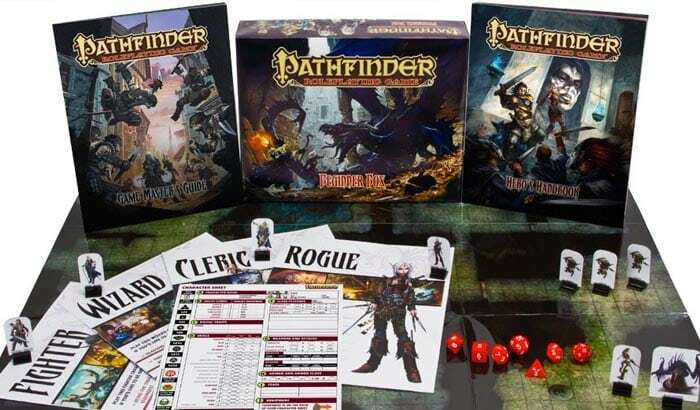 The Pathfinder Beginner Box comes with a 64-page Hero’s Handbook, detailing character creation, spells, equipment, and general rules for playing the game, a 96-page Game Master’s Guide packed with adventures, monsters, magical treasures, and advice, a complete set of seven high-impact polyhedral dice, more than 80 full-color pawns depicting heroes and monsters, four pre-generated character sheets, four blank character sheets, and a double-sided Flip-Mat play surface that works with any kind of marker. The Beginner Box offers a lot more in the realm of accessories. Paper miniatures and a play surface? Sounds pretty cool to me. The adventure included, titled Black Fang’s Dungeon, follows your rag-tag group of adventurers to fight a dragon in a dungeon. While perhaps ironic, this adventure isn’t designed for a long-running campaign, but more for a one-shot afternoon of learning the game with friends. The guide offers wonderful tips, but what the Beginner Box gives in accessories, it lacks in longevity that The Lost Mines of Phandelver has, while perhaps having more replayability. No doubt, the Beginner Box is an easy way to get started in Pathfinder. If you are a tad more inventive, want more customization, and perhaps want to save some money, you could check the The Pathfinder Reference Document. The Pathfinder Roleplaying Game is released under the Open Game License, meaning the core rules that drive the Pathfinder RPG system are available for anyone to use freely under the terms of the OGL. This compendium of rules, charts, and tables contains all of the open rules in the system, and is provided for the use of the community of gamers and publishers working with the system. It’s a larger offer of free content than Wizards offers with 5E, but not as user-friendly as buying the Core Rulebook would be. Paizo seems to offer more bang for your buck, so if you are wanting to get started on the cheap, it takes a little extra work, but could be well worth it. If you are purchasing either of these products, I recommend going to your friendly local gaming store to do so. You can get them online and shipped easily enough, but supporting local nerdy businesses is always the better option. You can find where to buy D&D products with this and Pathfinder by typing in your ZIP code here. Next week, I will delve into starting a campaign and being a game master. If you have any questions, feel free to contact me on Twitter.